Sixty-five-year-old Bruce Cook doesn’t set his alarm these days—except on race day. This is a huge change from his pre-retirement life in finance, when he worked on Wall Street and duked it out on the trading floor. Cook competed in his first triathlon at age 50, and enjoyed your typical middle-of-the-pack triathlon career until he got the right coach and retired from the rat race. It was then that Cook discovered not only is he better than a middle-of-the-pack kind of guy—he’s a front-of-the-pack athlete—and a darn good coach as well. We sat down with Cook to learn more about his journey from overly stressed age-group athlete to successful coach and four-time IRONMAN World Championship qualifier. You originally got into triathlons while working a pretty demanding job in finance. What are some of the golden rules you learned about time management and multisport training? After 38 years I’m actually trying to unlearn some of the habits I had there. I started triathlon at 50 and I’m 65 now. In the beginning it was mostly sprints and Olympics, and I had a coach and all of that. I worked with a few coaches, some remotely and some local, and I learned a lot. But I was really interested in the technical and data analysis aspects of training, and that’s what brought me to QT2 Systems and Jesse Kropelnicki. When I was working, I was up at 4:30 a.m. every day to train, and I would be at my desk by 7 a.m. Then I would be home by 6 p.m. or so and get my second workout in before shutting things down by 8 p.m. to relax a bit. Your sleep is already being challenged with a schedule like that, and so your ability to recover is being challenged, but at that point there was no other alternative. Just trying to figure out how to balance everything in my life was key, and for me it was putting in that cut-off time of 8 p.m. so I could unwind and get some sleep. The greatest training benefit for me was just the mental release, it kept me very sharp. I was one of the oldest guys working on the trading floor and could still hold my own. And then at night training allowed me to focus on something else other than work. So that was very beneficial, however, it meant that I had a pretty tight schedule. So what was sacrificed was my family time. Luckily, my kids were older at that point. I didn’t miss a lot of what they had to do because I was home in time to make all the sporting events and other social stuff. And they were at that stage where they could drive, so all they really wanted was some spending money and the keys to the car! But you always run that risk of impinging on your family time, that’s just the way it is. Once I pushed up to 70.3s and IRONMAN—it became a challenge. I did my first IRONMAN, in Coeur d’Alene, in my mid-50s. I remember just standing in the back of that huge group of swimmers on the beach wondering what in the hell was I doing. It was pretty intimidating. I’ve done 14 IRONMANS since then. So once I started doing IRONMANS I started doing about two a year. 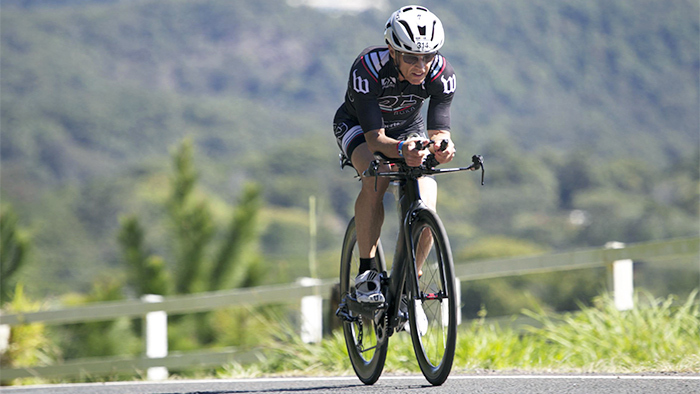 The first time I raced Kona was in 2012, which was about a year after I started working with QT2 Systems. How did you eventually decide to get into coaching? What is the most rewarding part about being a coach for you? I retired and basically spent those first three months decompressing and trying to do as little as possible. I didn’t set an alarm, and frankly race mornings are the only times I set an alarm these days. I’ve worked really hard learning how to sleep for seven or eight hours. It was actually hard to do after all those years on the trading floor getting by on much less than that. I knew I didn’t want to commute back to NYC, or work for a big organization. And I wanted to do what I enjoyed, which for me was triathlon. So I decided I wanted to give back to the sport. For me, I originally thought it would be just sharing my knowledge and experiences with other athletes, but it’s much more than that. Last year was my first season coaching and I had a woman who was a really good athlete but she had a stress fracture and was in a boot. And I was immediately concerned about my liability there, but we got along really well, and she’s the optimal client and so passionate and so consistent. And once she understood the approach I was using, we got her out of the boot, after a lot of water running, and we eased into preparations and by the end of the year she qualified for both the 2016 and 2017 70.3 World Championships. And she also will be racing Kona this year. So that made me feel pretty good—the positive feedback was really something. This year I started working with a young guy who initially told me he was so frustrated with swimming after seven years of racing triathlons that he was considering becoming a duathlete. I told him I wanted to tackle his swimming for a bit. And for the first three months he was using my swim workouts as well as working with a local instructor. He’s taken 20 seconds per 100 meters off of his pace. He’s now swimming sub-1:30s consistently. This year he’ll be racing at 70.3 Worlds as well. These people have tremendous capability and great work ethics and to a degree my job is just to reinforce their self confidence and help them have the best race possible. I love it. As a coach and a competitive triathlete, how do you balance your coaching duties and your training responsibilities? Because I’m retired, my training can happen whenever I need it to. So that helps. But obviously my coaching priorities are number one, and my training has to work around it. At QT2 we try to always get back to our clients within two hours, so if I’m on a long ride sometimes I have to check my phone frequently and make some emergency calls if needed. Racing alongside my athletes has been really fun actually. I ended up racing last year at the same events as my athletes and it’s convenient to be around them and have that group mentality about tackling the same event. During the lead-up to the race I can train with them and we can meet, talk and plan out our week and our race strategies. The only challenge is if it’s an “A” race for me, in which case I kind of try to shut things down the day before the race and tune everything out for a bit and get myself ready. But if issues pop up with an athlete, actually, it can be a positive distraction from my nervousness. You are racing both Chattanooga and Kona this year. Are both of these “A” races for you or are you using 70.3 Worlds as a tune-up race for the Big Island? I’ll let you know whether or not Chattanooga is an “A” race after it’s over! During the season, I would prioritize races that way, but with championship races it’s kind of a different thing. I was lucky enough to qualify for both of these races so I’m going to go for it with both of them. And I think five weeks in between them is just the perfect amount of time. If it were two back-to-back IRONMANS, that would be a different story. As an age grouper I don’t know how you would even go about doing that. What is one piece of advice you often give your athletes that you find you seldom follow yourself? Am I perfect with my nutrition? No. You have to live a little bit. But I do stress the importance of it to my athletes, always. But I love ice cream. And that’s the truth. We all have cheat days here and there, and I’m no different. What was really the differentiator in terms of your planning, strategy or experience that helped you cross the line into going from being a decent triathlete to a competitive, long-distance athlete racing in World Championships? The biggest change for me when I started working with QT2 Systems was my diet and nutrition plan. That is a gigantic focus for QT2 athletes. Quality carbs, lean protein and good oils. Once I adapted that to my eating plan, my weight moved to a much better place. I am about 15 pounds lighter than I was in college, which is quite unusual for someone my age. Those extra pounds have a potentially big impact on your performance. The second part to that is race-day nutrition; understanding your sweat rate and how much your stomach can handle during race intensity. And taking the weather into account and being able to plan for that. So the introduction of that side of the equation was new to me and really made a big difference for me. Let’s just say I used to spend time in the med tent and now I’m happy to say I avoid it pretty well. Check out our Facebook Live with Bruce at the 2017 IRONMAN 70.3 World Championship in Chattanooga, Tennessee.